The Tennessee Titans have suffered a setback ahead of Saturday’s playoff game against the Kansas City Chiefs. 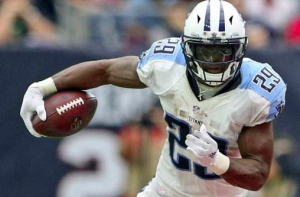 The Titans announced Thursday that running back DeMarco Murray will not be available for Saturday’s game because of a knee injury. Instead of utilizing a two-headed rushing attack, Tennessee will now be forced to lean heavily on Derrick Henry in the running game. Murray suffered an MCL injury during the team’s Week 16 loss to the Rams. The Titans managed to beat the Jacksonville Jaguars in Week 17 without him, a win they needed to secure a playoff birth. Tennessee will now have to do that again this week against the Chiefs. There’s also no guarantee that Murray would be able to return the following week if the Titans are able to win and advance to the Divisional Round. Henry and Murray have split the carries almost evenly all year. Henry has been a little more productive over the course of the season in terms of yards per carry. However, the two have formed a viable duo in the Tennessee backfield. Outside of Henry, Murray, and quarterback Marcus Mariota, no one on the Titans has more than eight carries on the season. That will force Henry to carry the load against the Chiefs on Saturday. With Murray out last week against the Jaguars, Henry ran the ball 28 times but gained just 51 yards. To be fair, he also took a screen pass 66 yards for a touchdown. However, he failed to give the Titans a consistent rushing attack against a stout Jacksonville defense. Fortunately for the Titans, Henry knows he has to do better against the Chiefs and was his own worst critic after last week’s game. It’s vital that the Titans establish a consistent ground attack against the Chiefs. With Mariota’s inconsistent play this season, he’s unlikley to carry the Titans to a win, especially on the road. To be fair, Kansas City’s defense has been average at best this season. However, the Chiefs do have a pair of quality pass rushers in Justin Houston and Chris Jones. If the Titans can’t run the ball consistently, Houston and Jones will be more likely to put pressure on Mariota and create problems for the Tennessee offense. With Murray unavailable, Henry undoubtedly becomes one of Tennessee’s most important players against the Chiefs. He’s had his moments this season but has been largely inconsistent. If Henry doesn’t have one of his best games of the season, it’s hard to envision the Titans pulling off the upset on the road.